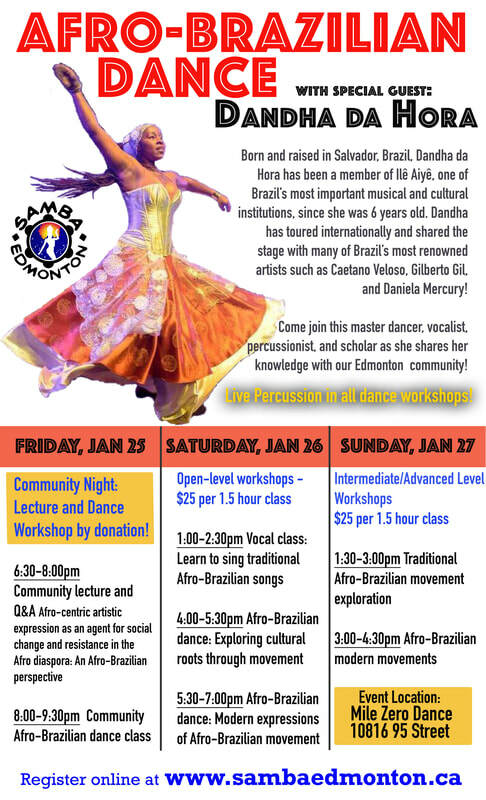 Samba Edmonton teaches classes and workshops focussing on a variety of Brazilian dance styles including the famous samba no pé, samba de roda, axé, and multiple Afro-Brazilian dance forms including danças dos Orixás, samba reggae, and maculêlê. We also provide workshops in a variety of Brazilian percussion styles. Free Learn to samba class! Registration not required, come join us on May 1st! This class will focus on exploration of fun movement choreography founded in current Brazilian street dance styles such as samba reggae, swingueira, and Brazilian funk. Session suited for all dance levels including beginners! This session will focus on the further development of samba no pé speed, technique, and freedom in movement. Students will work on a choreography throughout the duration of the session. Join Dandha da Hora, master dance teacher, vocalist, and performer, in her very first workshop intensive series in Canada! All dance workshops will feature live percussion with guest musicians, Reni Ferreira, Helio Conceição, and Jadson Souza! Stay tuned for a samba party with live performance by Dandha da Hora and guest musicians on the evening of Saturday, January 26!! Location will be announced at workshops. Community Night - Entry by donation! 6:30-8:00pm: Lecture and Q&A with Dandha da Hora​. Afro-centric artistic expression as an agent for social change and resistance in the African diaspora: An afro-Brazilian perspective. 8:00-9:30pm: Intro to Afro-Brazilian dance workshop with LIVE PERCUSSION! Weekly performance team rehearsals incorporate both our percussionists and dancers. If interested in joining or percussion troupe or dance team, please directly contact admin@sambaedmonton.ca for more information!